Watford Grammar School for Boys (commonly abbreviated as WBGS) is a partially selective academy for boys in Watford in Hertfordshire, England. The school and its sister school, Watford Grammar School for Girls, descend from a Free School founded as a charity school for boys and girls by Elizabeth Fuller in 1704. Despite its name, the school accepts boys of all abilities, although approximately a third are selected for academic or musical aptitude, and brothers of existing pupils are also guaranteed places. Its results are among the highest achieved by non-grammar state schools in England. In 1704, Mrs Elizabeth Fuller of Watford Place built the Watford Free School for forty boys and twenty girls on her land next to the churchyard, with rooms for a Master and a Mistress. 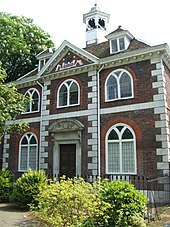 The school-house was a fine structure at the south-west corner of St Mary's churchyard, and can still be seen there. In 1708 Mrs Fuller endowed the school with a rent-charge of £52 a year. The boys were taught to read, write and cast accounts, and the girls to read English, to knit and to sew. The £52 a year was augmented with bequests, producing a revenue of £178, but the rent-charges were fixed and lost their value through inflation. Despite the help of endowments and gifts, the original charity school was in a sad state by the 1870s, when an application to the Charity Commissioners to sell part of the endowment to pay for overdue repairs led to an enquiry into the school. In 1878, the Commission forbad the school from admitting any more pupils in its current state, and asked the trustees to choose between turning the school into a public elementary school or amalgamating with a sum of £13,333/6/8d from the Platt Foundation for Aldenham School to form a new middle class school. With some reluctance, the trustees chose the latter, and the free school closed on 10 August 1882. The 13 boys and 2 girls still at the school were placed in local elementary schools. On the left is the coat of arms of John Chilcott (Elizabeth Fuller's father), which are inscribed over the door of the Free School. On the right is the coat of arms of Richard Platt, which may also be seen at Aldenham School. The schools' motto dates from the same period, and was taken from Virgil's Aeneid IX, 158: "pugnam sperate parati" ("look forward to the battle, being prepared"). Sites were found in Derby Road for two new schools adjoining each other, one for boys and a smaller one for girls. (These buildings are now the Central Primary School.) The new boys' school was opened by the Earl of Clarendon on 21 April 1884, and the girls' school the next day. They started with 69 boys and 46 girls, rising to 129 boys and 68 girls during the year. In 1903, the schools' names were changed to the Watford Grammar School and the Watford Grammar School for Girls. By 1904, the schools had outgrown their buildings, with 312 boys and 148 girls. With the help of Hertfordshire County Council, a new girls' school was built and opened in Lady's Close in 1907, and the boys spread into the building the girls had vacated. In return, the council demanded changes in the schools' denominational character, and in 1908 a revised scheme removed the requirement that masters and mistresses belong to the Church of England and allowed pupils to opt out of instruction in the teachings of the Church. The leaving age was also raised to 17, and the number of scholarships increased. The building was still insufficient for the boys' school, and with assistance from the County Council the school purchased part of Cassiobury Park facing Rickmansworth Road to build a new school. On 23 February 1912, the boys assembled outside the Derby road buildings and walked to the new site, which was formally opened by the Earl of Clarendon on 20 March 1912. Sixth Form courses were introduced during the First World War. In 1924, Rugby union was introduced in the boys' school and took over from football as the main winter sport. The schools had become increasingly reliant on the county council for building funds, and with the introduction of the Tripartite System in 1944, the schools fully entered the maintained sector as voluntary controlled grammar schools. The schools also phased out their preparatory or junior departments to become purely secondary schools. With the scrapping of the Tripartite System, they became comprehensive in 1975, and continued to expand. They became grant-maintained schools in 1990, controlled by their own governing bodies, independent of the county council, and funded directly by the Department for Education, and in 1995 introduced partial selection. In 1999 the schools converted to voluntary aided status. The two schools maintain matching admissions policies. The selective proportion of their intake has been reduced since 1995, and currently stands at 25% academic and 10% musical aptitude. Their catchment area for selective admission reaches out about 5 miles, including some northern parts of the London boroughs of Harrow and Hillingdon. The schools also give priority to siblings of current pupils. Prior to 2008, each of them also gave priority to siblings of pupils at the other school (Watford Grammar School for Girls). In 2010 the school became one of the first schools rated 'outstanding' by Ofsted to become an academy, along with the girls school. Every year there is a Founder's Day service to commemorate the charitable foundations and to celebrate Dame Elizabeth Fuller's commitment and dedication to the school. This service is carried out at St Mary's Church in Watford Town centre. In 2016 The Independent Newspaper Published a table listing Watford Grammar School for Boys as the 7th Best Comprehensive or Partially Selective in the United Kingdom. The school is located about 1 kilometre (0.6 mi) west of Watford town centre, just to the south of Watford tube station and Cassiobury Park. The 120-metre (390 ft) long neo-Georgian main block and the adjacent Master's House are Grade II listed buildings. The school was used as a location for many of the external and internal shots in the filming of The History Boys. In recent years the school has built a gym, a music block (also partly owned by Hertfordshire School of Music) and a Sixth Form centre with a food technology lab, financed through fundraising and the sale of land on the northern edge of the grounds for residential development. The school's music block, the "Clarendon Muse", stands on the front lawn of the school. The building was completed in December 2007 at the cost of £5 million, and has approximately 2,000 square metres (22,000 sq ft) of space spread out over four floors. It is also used by the Hertfordshire School of Music in the evenings and weekends. The school's new STEM Centre for the teaching of science, technology, engineering and maths was completed in November 2017 and opened by Lord Robert Winston. Funding was providing by national and local government and parental donations supported the fittings and fixtures of the building. Many sports are played at the New Field (shared with the Old Boys sports clubs) beside the Grand Union Canal near Cassiobury Park. In the 1950s there were five houses; Bushey, North, South, Travellers and New. Fuller was added during that decade. Don Anthony, Represented Great Britain in the 1956 Summer Olympics in the Hammer Throw. Dedicated his life to the Olympic movement. David Sullivan (1949– ), pornographer and former director of Birmingham City FC, current co-chairman of West Ham United F.C., joined the sixth form in the 1960s. Grant Shapps (1968– ), Chairman of the Conservative Party (2012–2015), MP for Welwyn Hatfield (2005–). James Smith (1985–), musician and lead singer of Hadouken! Sir Stanley Rous (football referee and FIFA president) was an assistant master (sports) 1921–1934. Harry Rée (educationist and wartime member of the Special Operations Executive) was headmaster 1951–1962. George Walker (director general of the International Baccalaureate Organization) was a chemistry teacher 1966–1968. The Old Boys Association, formed in 1894, is known as the "Old Fullerians' Association". All former pupils and past and present teachers and governors of the school are eligible for membership. Serving teachers automatically become honorary members. The mission of the Association is to support the school and its students. This is currently achieved by raising funds for selected school projects and also by giving Old Boys opportunities to stay in touch with each other and with the school through events including the annual OFA Dinner, through newsletters and also through the very strong cricket and golf sports societies. ^ "A-Levels: Comprehensives and Academies results 2010". The Guardian. London. Archived from the original on 1 December 2013. Retrieved 27 December 2010. ^ The Mrs Elizabeth Fuller Free School, Images of England, English Heritage National Monuments Record. ^ Samuel Lewis, ed. (1848). "Watford (St. Mary)". A Topographical Dictionary of England (7th ed.). p. 486. Retrieved 22 March 2008. ^ William Page, ed. (1908). "Watford: Introduction". A History of the County of Hertford: volume 2. Victoria County History. pp. 446–451. Retrieved 22 March 2008. ^ W.R. Carter (1894). "Mrs. Fuller's Free School". Watford Endowed Schools Journal. 3. ^ a b c d e W.G. Hughes; M. Sweeney (1954). Watford Grammar Schools for Boys and Girls: A History of their Foundation and Development. Watford: Mayflower Press. ^ a b c d e f g Neil Hart, ed. (2005). Mrs Fuller's Free School: Three Hundred Years of the Watford Grammar Schools. Rickmansworth: Atlantic Publishing. ^ Main block at Watford Central Primary School, Images of England, English Heritage National Monuments Record. ^ Elizabeth Passmore (26 September 2008). "Determination: Watford Grammar School for Girls". Office of the Schools Adjudicator. Archived from the original on 24 March 2009. ^ Neil Skinner (2 September 2010). "Two Watford schools become academies". Watford Observer. ^ "These are Britain's 100 best state schools". 26 August 2016. Retrieved 29 September 2016. ^ Main block at Watford Boys Grammar School, Images of England, English Heritage National Monuments Record. ^ Master's House at Watford Boys Grammar School, Images of England, English Heritage National Monuments Record. ^ Adam Lusher (26 June 2005). "The present mirrors the past for pupils at The History Boys school". The Daily Telegraph. London. ^ "New community music centre named Clarendon Muse" (PDF) (Press release). Watford Grammar School For Boys and Hertfordshire County Council. 9 January 2008. Archived from the original (PDF) on 7 January 2009. Retrieved 31 May 2008. ^ [https:web.archive.orgwe20080516005904http:www.hertsdirect.orginfobasedocspdfstorehorizonssum08.pdf "New home for music school"] (PDF). Horizon. Hertfordshire County Council: 8–9. Summer 2008. Archived from the original (PDF) on 16 May 2008. ^ "A Book of Remembrance 1914 1918 (Watford Grammar School)", Published by the Naval and Military Press, ISBN 978-1-84342-424-6, p.44. ^ a b c Who Was Who, volume VIII: 1981–1990. London: A & C Black. ^ "Leslie Bonnet", by Frank Dancaster. THE OLD LADY, June 1986. ^ Who Was Who, volume VII: 1971–1980. London: A & C Black. ^ "'Famous' Watford pilot's WW2 Gestapo bombing medals to be auctioned". The Watford Observer. ^ "Terence Brandram Hastings Otway". The Otway Family Tree. ^ Quentin Skinner; Tony Wrigley (17 November 2001). "Peter Laslett". The Guardian. ^ "Air Vice-Marshal Colin Coulthard". The Daily Telegraph. London. 29 November 2004. ^ "The Rev Arthur Peacocke". The Daily Telegraph. London. 25 October 2006. ^ "Updating education". John Clark Pro Se Blog. 29 April 2005. Retrieved 11 August 2008. ^ Hosking, Patrick; Wighton, David (9 February 2007). "Professor A. D. Nuttall". The Times. London. Retrieved 14 April 2008. ^ a b c d e Who's Who 2008. London: A & C Black. ^ T.J. Pedley (19 April 2000). "Professor David Crighton". The Guardian. London. ^ Kemp, Jackie (29 October 2010). "Obituary: Professor John Orr, teacher and writer". The Scotsman. Edinburgh. Archived from the original on 2010-10-29. ^ "Sir Ian Prosser, Chairman, Bass PLC Elected As Chairman of World Travel & Tourism Council" (Press release). World Travel & Tourism Council. 15 May 2001. ^ "The Bishop of Chichester: Rt Revd John Hind". The Diocese of Chichester. Archived from the original on 2003-03-17. ^ Michael Rosen. "About me". ^ "Ways of Giving". Watford Grammar School for Boys. Archived from the original on 2004-12-28. ^ James, Scott (14 July 2000). "Simon's in a league of his own". The Mirror. London. Retrieved 30 June 2010. ^ Thompson, James (10 June 2010). "Steve Easterbrook: An appetite for more growth at McDonald's UK". The Independent. Retrieved 29 January 2015. ^ "Josh Lewsey". London Wasps. Archived from the original on 2011-04-02. ^ "Duncan Hames". The Telegraph. London. 2010. Archived from the original on 31 August 2011. Retrieved 27 May 2011. ^ "Young Gun: Alex Lozowski – Leeds full-back". ^ "Rée, Harry Alfred". Archives in London and the M25 area, Institute of Education. ^ "Professor George Walker, OBE receives honorary doctorate" (Press release). Centre for the study of Education in an International Context (CEIC), University of Bath. 9 December 2003. Archived from the original on 2008-06-23. ^ "John Holman – Biography". Department for Children, Schools and Families. Archived from the original on 15 April 2009. Retrieved 1 January 2010. ^ Cherryman, Beth. "Headteacher of Watford Grammar School for Boys, Martin Post, said he enjoyed every day". Watford Observer. Retrieved 27 August 2015. ^ Cherryman, Beth. "Ian Cooksey appointed new head teacher at Watford Grammar School for Boys". Watford Observer. Retrieved 27 August 2015.